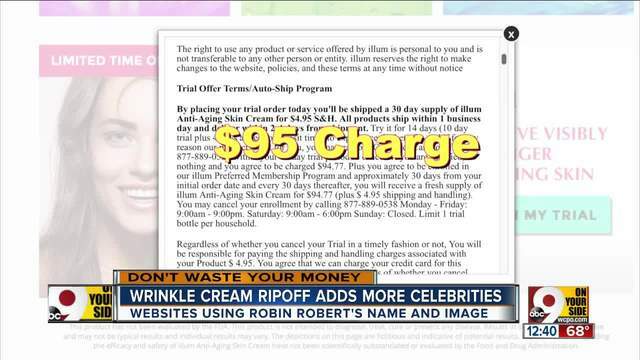 It's the wrinkle cream rip-off that wont go away. And now the people behind it are using the name and image of Robin Roberts, host of ABC's "Good Morning America." 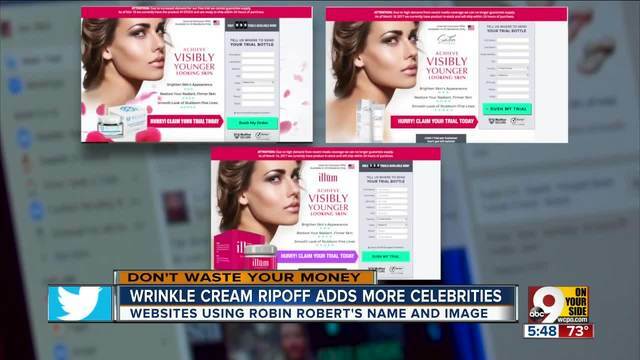 The beloved TV host is the latest celebrity supposedly quitting her show to launch an amazing skin care line, according to ads popping up on Facebook, that appear to be legitimate articles from People, Shape, and other women's magazines. Three months ago, we reported on HGTV's Joanna Gaines, star of Fixer Upper, being used in similar ads. Those headlines claimed an "HGTV Nightmare: Joanna Gaines leaves show to start a cosmetic line." Lisa Zillich, who took the bait and gave her credit card number, explained how easy it is to get lured in to these so called free trial offers. "I saw an ad for their eye serum, and it was just $3.95 for a trial," she told us earlier this year. But Zillich, and hundreds of other women, are complaining online that the $4 trial offers turn into $95 monthly charges, if you don't cancel within a tiny 14 day window. They say by the time you receive the first jar of cream, and try it for 2 or 3 nights, you have missed the cancelation period. The products seem to change by the week. We found in one case it was Derma Folia Renewal...in another instance it was Satin Youth Cream...and in the case of Robin Roberts, a product called Vlamorous. All use photos of the exact same beautiful women: they just change the name of the product. We have emailed these products several times for more information, but they have never gotten back to us. We traced Zillich's package back to a mailbox in a suburban shopping center in Utah, but it had already moved out by the time we found it. The truth is that Joanna Gaines has not launched any line of skin cream. She has nothing to do with any of these products, and is not leaving HGTV. Robin Roberts is not leaving Good Morning America either, and has not launched a skin care line. Nor has Oprah, Ellen Degeneris, or the stars of the CBS show NCIS, who are also appearing in some ads. These stars do not use any of these products, and you should not, either. If you sent money, and missed the cancelation window, file a complaint with your state Attorney General (several are now investigating), and file a dispute with your credit card company.